US bulk equipment - living the American dream? Krech Ojard Engineers recently worked with Malteurop North America at its Winona, Minnesota processing and storage facility on a project involving transfer of malted barley by belt conveyor across a rail courtyard to greatly simplify their material transfer requirements. For over 30 years, Krech Ojard & Associates, Inc. has specialized in commercial and industrial projects in bulk material storage and handling, transshipment facilities, manufacturing, mining, pipelines, ports, and railroad facilities across the globe. Krech Ojard Engineers specialize in civil, structural, mechanical, electrical, rail, and marine engineering that are brought together to offer requisite integrated engineering solutions for their clients’ specific requirements. At this facility, Malteurop North America produces batches of malted barley for the beverage and food market on a continuous basis. Each batch of malted barley is the culmination of a precisely timed malting process that takes seven days from start to finish. The zenith of each batch involves the periodic transfer of malted barley from their kilns every eight hours, 365 days a year. Prior to this project, material transfer out of the kilns to the grain elevators for rail loadout involved nine different drag conveyors and bucket elevators. Some of the legs of the transfer route were requiring extensive maintenance and were at the end of their service life. The unique requirements of this project included a need to feasibly tie in the new conveyance system with extremely tight constraints at the two ends coupled with constraints along the conveyor route traversing the courtyard above three active rail spurs. Krech Ojard’s involvement began in 2011 while teaming with conveyor manufacturer, RAPAT, to assist with the feasibility of a general layout requiring new helical pile foundations, structural reinforcement, and equipment for the project. This feasibility work assisted Malteurop in its cost estimation and capital planning. Because of the tight constraints with the angles and elevation changes, Krech Ojard chose to utilize 3D scanning of the conveyor route and was able to conduct scans while trains and mechanical systems were running. Site scanning greatly enhanced the precision of the design between the two tie-in points, supplemented field measurements and the existing drawings, and replaced the need for a traditional survey for dimensional control. Modelling of the conveyor span was performed in multiple software packages and combined in AutoCAD Revit which created a traversable digital environment of the facility with the new models. Incorporating RAPAT’s preliminary conveyor model allowed a precise review to check for interferences requiring design adjustments before the design packages were final. This 3D scan and design model process largely eliminated surprises during construction. Multiple clearances of less than one inch were predicted and met when construction was complete. Krech Ojard’s integrated engineering services involved structural design of conveyor and equipment structures, mechanical experience for dust collection and review of explosion venting panels, and civil expertise with class 1 mainline rail carriers that serve the facility. All three service groups were involved in the collection or processing of 3D scan data of Malteurop’s facility. In August 2014, Malteurop’s conveyor system was installed in a 24-hour window skipping just three batches of malted barley. Start-up at the end of this 24-hour construction window was critical because barley had to be transferred out of the kilns from a malting process that was started seven days beforehand. Dust collection and access platforms have been installed between batches with the final aspects of construction this past fall. Since installation, Malteurop reports that breakage of barley is noticeably reduced because of the new belt conveyor which will help expedite the payback of the new transfer system. Malteurop expects to be well on its way to many years until their next shutdown and Krech Ojard’s belief in the benefit and effectiveness of 3D facility scanning continues to grow. ABOUT KRECH OJARD & ASSOCIATES, INC.
Krech Ojard & Associates, Inc. is a progressive firm offering professional, high quality engineering and architectural design services for private clients, commercial, industrial, and municipal agencies. Based in the United States and working globally, Krech Ojard professionals work in intermodal, mining, pipeline, manufacturing, agriculture, and bulk material storage and transload related to taconite, coal, minerals, grain and food products, and pulp. Flue Gas Desulphurization gypsum (FGD gypsum) is a bulk material capable of developing a negative angle of repose. FGD gypsum can be characterized as an extremely cohesive bulk material that can adhere to vertical surfaces, building-up on small ledges, box corners, shallow angle plate work and minor surface protrusions or interruptions. As a result of its cohesive strength FDG can plug-off transfer points and chutes within seconds, making the conveyance of this bulk material extremely challenging. The geometric construction of transfer chutes and hoppers that convey FGD gypsum is an important element of effective design. Geometry that incorporates shallow wall angles, box corners, valley angles, square and rectangular shapes with high friction surfaces materials is a major contributor to issues such as plugging, bridging, arching and loss flow. TIVAR® 88-2 liners are excellent choice for addressing the flow problems associated with conveying FGD gypsum. TIVAR® 88-2 liners offer a low coefficient of friction non-stick surface which significantly reduces the ability of FGD gypsum to stick and build-up on the interior surfaces of hoppers, flop gates, diverters, transfer housings, chutes, belt cleaners, and return idlers. By taking advantage of the flexibility of TIVAR® 88-2 liners Lawrence Industries offers pre- fabricated liner kits, fabricated drop-in inserts or complete polymer chutes and hoppers. These design options serve to improve the reliable flow and discharge of FGD gypsum by using round and radius surfaces with welded seams and minimal surfaces penetrations. Lawrence Industries, Inc. has been in business for thirteen years providing solutions for a variety of industries. 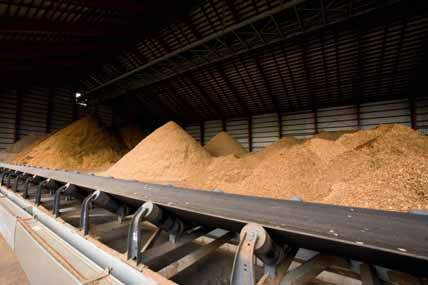 Headquartered in Fort Wayne Indiana its staff has over 30 years of bulk material handling experience. The company is a privately held company that believes in working with each customer to provide the best solution possible based on application specific needs. Lawrence Industries, Inc. is focused on providing solutions to problems associated with bulk material flow, wear and corrosion. Its solutions include a variety of material technologies offered in products, fabricated parts, machined parts, lining systems and installation services. Phoenix Products Company Inc. has built a solid reputation with its durable lighting solutions for bulk handling equipment. Phoenix introduced LED technology to the industry in 2011. In collaboration with customers, the company remains at the forefront of LED fixture design and has optimized lighting at countless terminals worldwide. In response to the industry’s desire to integrate cutting-edge technologies while simplifying sales channels, Phoenix is introducing a new company - Phoenix Terminal Solutions. Phoenix Terminal Solutions is the industry’s first and only global sales agency exclusively serving container, intermodal and bulk terminals. It represents a select number of trusted brands that all share a common goal - offering modern technologies that deliver safety, operational and environmental benefits to terminals. Phoenix Terminal Solution’s global sales network enables the immediate service and response that terminals require while streamlining the sales and procurement channel to deliver maximum value to customers. In addition to providing Phoenix’s LED options for equipment, Phoenix Terminal Solutions offers premium Light Emitting Plasma (LEP) fixtures designed by Bright Light Systems. Just as LED technology has become the standard for terminal equipment, LEP fixtures have proven to be ideal for tower, yard, warehouse and area lighting. options. It has teamed up with LASE — a major supplier for laser measurement systems. LASE has led the industry with their anti-collision systems and bulk volume measurement systems for stackers, reclaimers, shiploaders and GSU systems. Lars Ambrosy, CEO of the Germany-based manufacturer says, “We are gladly looking forward to our new partnership with Phoenix Terminal Solutions. LASE strengthens its presence by this partnership in the North and Central American regions. Phoenix stands for quality as well as high-value products and services, which also reflects the philosophy of LASE.” Phoenix Terminal Solutions aims to build on the recent LASE bulk terminal successes with heap volume measurement systems and automated solutions for wagon car tipplers. Established in 1966, Jenike & Johanson is an international technology company for bulk solids handling, processing and storage. Jenike & Johanson has extensive laboratory facilities located around the world for characterizing the flow properties of bulk solids under representative environmental conditions. Skilled engineers provide detailed structural and mechanical design of solids handling equipment, and routinely design stockpile and gravity reclaim systems, silos, feeders, loading and transfer chutes, blending systems, and custom equipment (e.g., purge/drying/conditioning vessels, large slide gates, etc.). Jenike & Johanson can also manufacture and supply custom equipment, from small one-of-a-kind items to complete systems, providing a complete solution with single source responsibility and a performance warranty. Bulk solids handling problems are often the major cause of costly downtime and demurrage charges for many facilities, especially during startup. These same flow problems continue plaguing on-going operations by limiting throughput, impacting product quality, and creating safety and health risks, as well as reducing equipment life, increasing maintenance costs and causing premature equipment failure. To address these costly problems, Jenike & Johanson has developed proven ways to design handling equipment to promote the smooth, unrestricted flow of bulk solids safely and reliably. Jenike & Johanson doesn’t guess at material properties, they measure them. For nearly 50 years, Jenike & Johanson has focused on developing first principle theories on bulk solids flow and conveying behaviour. Its research focuses on providing its customers with tools for solving real world bulk solids handling problems. The company’s engineers’ practical experience is also critical to project success. They combine test results and real world project experience, which yields the best solution in terms of reliability and cost-effectiveness. Every step of their work is centred on a bulk material’s handling characteristics, whether it involves testing, engineering, detailed design or equipment supply. This proven sound approach continually produces outstanding results for the company’s customers. A synthetic polymer producer was looking for unique technology that could work in its new production line. This line was going to run custom polymers and compounds. What was needed was one unit that could handle various materials and production rates. In addition, the customer previously had a competitor’s brute force spiral and was familiar with basic brute force technology, but unfamiliar with the capabilities of General Kinematics’ (GK) Two-Mass design. GK worked with the customer to help educate them on the advantages of two-mass drive technology. Two-Mass would enable closer interface with adjacent transfer equipment, thus reducing overall height requirements by eliminating the transient response associated with brute force drive technology. This spiral would therefore meet the low head room requirements needed in the new production line. Secondly, GK’s Variable Force (VF) wheel technology would allow for instantaneous stroke adjustment from maximum to near zero without changing the motor speed, eliminating the requirements for plug stops or DC brakes. Without such devices, brute force drives produce very pronounced transient displacements during starting and stopping. Interface clearances, and resulting overall height, with brute force drives must be increased significantly to avoid contact with adjacent equipment during a power loss coast down. General Kinematics was chosen to supply a vibratory spiral conveyor incorporating a ‘Multi-Stage Process Air Supply’ for the new production line. This unique GK capability enables the customer to rapidly adjust process air flow and temperature at each spiral process stage to optimize production conditions for the multiple polymer formulations to be produced. The GK two- mass natural frequency variable force feature enables quick adjustments in conveying rates for optimization of bed depth and residence time in the process stages. Also, the GK Two-Mass natural frequency technology minimizes the motor starting torque demand resulting in much lower motor power requirements. Controls, incorporated as an integral part of the spiral operations, alert operators of upset conditions where significant adhesion of the polymer being produced may abruptly occur.The controls automatically maintain the set point peak to peak displacement while issuing a warning to operators to alert them of sticking of the polymer to the spiral flight.This upset notification allows time for the operators to address polymer sticking while the spiral remains in operation at the set point conditions. Once the issue is addressed, the controls reset and operation continues under normal satisfactory conditions. Installed Spring 2015, the GK vibratory spiral conveyor has lived up to the customer’s expectations. The two-mass drive, in combination with the advanced control system, offers significant process control improvement over the previous brute force spiral. The maintenance department was thrilled to learn that bearing L10 life is typically several hundred thousand hours, extending bearing life considerably. All lubrication is grease, remotely applied during operation, eliminating the maintenance associated with static oil splash. They are putting this to the test now. General Kinematics Corporation, incorporated in 1960, was established to market, design, and custom fabricate innovative vibratory material handling and processing equipment. Today the company is one of the world’s largest suppliers of vibratory processing equipment, holding hundreds of worldwide patents, and acknowledged as a major contributor to the technical advancement of vibrating equipment design and application. Over 50,000 General Kinematics units have been installed in virtually all of the world’s industrialized countries.